The European Commission has announced a support package of €143 million today for the early recovery and reconstruction needs in Borno State in Nigeria which is suffering from a worsening humanitarian crisis. Nigeria is one of four countries across the globe experiencing or at risk of famine this year, along with Somalia, South Sudan and Yemen. The package combines short term EU humanitarian aid with long term development support to help those in the affected area, which has been devastated by the terror campaign of Boko Haram. This reflects the Commission’s strategic approach to resilience, which was presented a week ago. Commissioner for International Cooperation and Development, Neven Mimica, made the following announcement today: “Our support package of €143 million will assist approximately 1.3 million internally displaced people and affected communities in and around the Borno State in Nigeria. Our assistance will not only target the immediate needs of the people but, it will also help to restore basic services, stimulate employment and create livelihood opportunities, particularly for women and young people”. This brings total EU support for the crisis in Nigeria’s Borno state to €224.5 million for 2017, following earlier announcements of €81.5 million in humanitarian aid. In line with its strategic approach to resilience, the European Commission is providing a comprehensive package of humanitarian and development measures for the crisis in Nigeria. EU support will provide immediate humanitarian assistance for the most vulnerable populations affected by the ongoing emergency situation, as well as for early recovery and restoration of basic services, such as health, nutrition, education, water access, sanitation and hygiene, solar power, in areas of return or resettlement. Furthermore, it will provide social protection, stimulate employment and livelihood opportunities, with a special focus on women, young people and vulnerable households. By strengthening public administration and financial management systems in the Borno State, it will help improve sustainable public service delivery, crisis management and coordination of related donor activities. The €143 million announced today consists of development aid of €123 million from the Nigeria 11th European Development Fund National Indicative Programme and €20 million from the EU Emergency Trust Fund for Africa. It comes in addition to the previously announced €81.5 million in humanitarian funding. It is further in addition to €177 million in development assistance from the EU Emergency Trust Fund for Africa, which was recently allocated to support 17 projects in and around the Lake Chad area. Nigeria faces one of the worst humanitarian crises in its history over five million people in need of urgent food assistance. A large proportion of the Borno population has little or no access to clean water, sanitation, shelter, education, primary health care (60% of health infrastructure is either destroyed or damaged), and is food insecure. 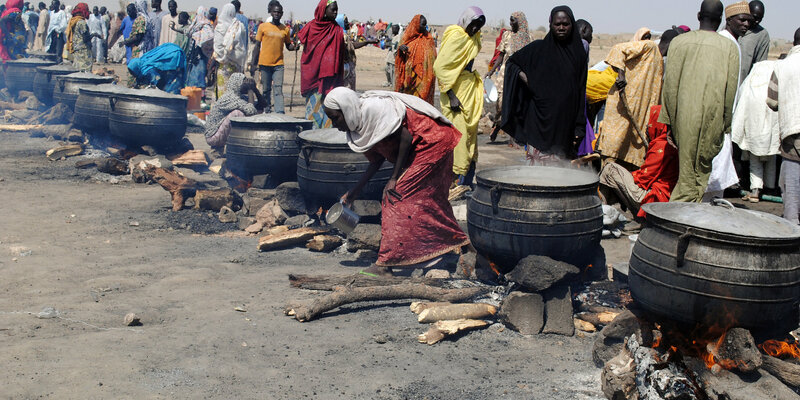 There are an estimated 1.7 million internally displaced persons, the majority, living in and around the urban area of Maiduguri, the State Capital of Borno and almost 200,000 refugees from Nigeria in the neighbouring countries around the Lake Chad.